Permutations brings together two artists with distinct interest in the relationship between configuration and connotation, visual stimulus and content, and structure and substance. Hyang Cho uses musical and visual vocabulary to interrogate the relationships between contour, rhythm and harmony while Roula Partheniou explores ideas of complexity, choice, logic and permutation through her use of the Rubik’s Cube in mapping possibilities. Jorge Luis Borges’s “The Library of Babel” describes an infinite honey-comb-like library filled with an infinite number of books. Each book in Borges’s bibliophillic nightmare is minimally different from its nieghbour—the library effectively contains all possible permutations of all possible books, obsessively arranged in a hive-like structure. Citizens in this phantasm are doomed to wander the library’s unending corridors in a vain search for meaning and enlightenment. Artists—like Borges’s librarians—are now responsible for not only being arbiters of public taste (whereby their ouevre is built upon issues of selection) but also theorists of information consumption (whereby their ouevre is built upon matters of parsing). 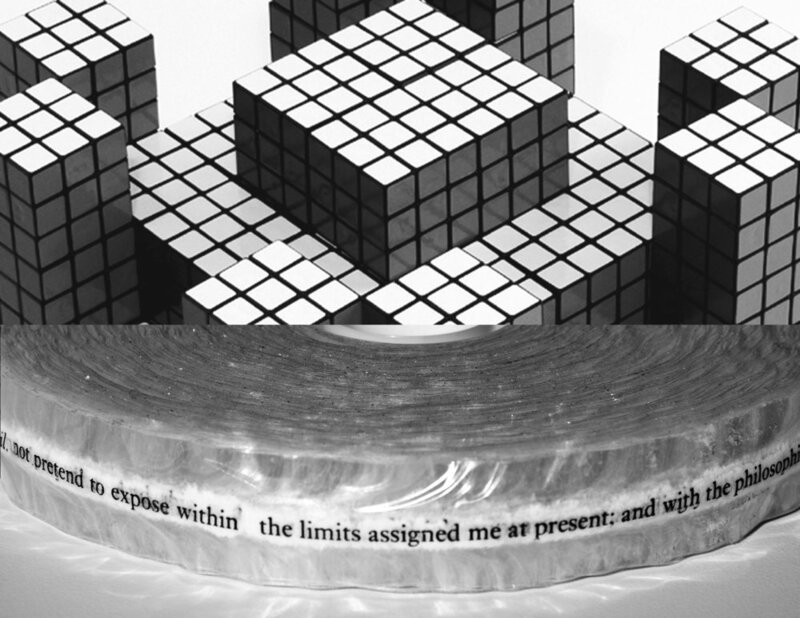 Roula Partheniou uses Rubik’s Cubes to extend a discussion around logic, scale and language. Her 100 Variations presents an exhaustive cataloging of the arrangement of geometric objects in a way which points back to the oeuvre of Sol LeWitt. Using 6 × 6 × 4 stacks of the ubiquitous children’s toy renowned for its combinatory nature, Partheniou playfully presents the permutation of these toys in a disorienting architectural display. Distanced from the viewer through photography, each piece becomes the 3-dimensional plan for an imposing Brutalist structure. The harsh lighting and shadows in Partheniou’s photography are illusionary. The shadows suggest an architecture built to reduce human involvement to mere ciphers within a beaucratic grid—but those shadows (much like the scale of the sculptures themselves) are structures built from our own terror. Partheniou has chosen to reject the Rubik’s Cube’s original chromatic array in favour of a minimalist scheme of white, black and a gun-metal gray. We are subjected to a playful uncertainty of scale, architecture and arrangement. Much as Partheniou’s architectural structures impose a presence without entrance, Hyang Cho’s bookworks suggest a reading without reading. We expect our architecture to be transparent; that we can move from one space to another with the minimum amount of interference or trouble. We do not want to be overly aware of how our body occupies our living space. We expect the same from reading. Cho’s bookworks trouble our literacy and our expectations around reading itself. The content of the book asserts itself in a way which makes reading (and writing) palpable. In each piece the narrative of the book-narrative asserts itself beyond the mechanics of the book-container into a new form. These new sculptural books allows the information to assert how it wants to be read, how it believes it is best received. Reading is a participatory act not only demanding active readers (readers who insert their own sensibilities and desires into the text) but also active narratives (who assert their own sensibilities and desires onto the form of the book itself). No longer are the tales happy to be safely ensconced between covers, they want a new form, a form which places the text before the reader. Narratives are no longer clearly transmitted, they are locked, they struggle, they assert; they free themselves from the bounds of readerly expectation into some new. Partheniou creates and photographs the barbicans and fortresses which loom over our dreams; each tower is constructed from the logic puzzles of our subconscious. Cho suggests that within each of these fortifications writhe our dream-narratives, struggling to assert their own shape. Partheniou and Cho document the hallucinatory furniture of our reveries; they provide both the oneiric palaces and the bibliophillic tour guides which squire us through the boulevards.